This means you get a forecast for your location not some other location that may have different land uses characteristics or terrain features (Figure 1). The K-NWS uses high resolution terrain (90 m) and land use (900 m) data sets to derive the most accurate representations of Australian conditions. We then run our model out to 7 days, providing high resolution weather information every hour. 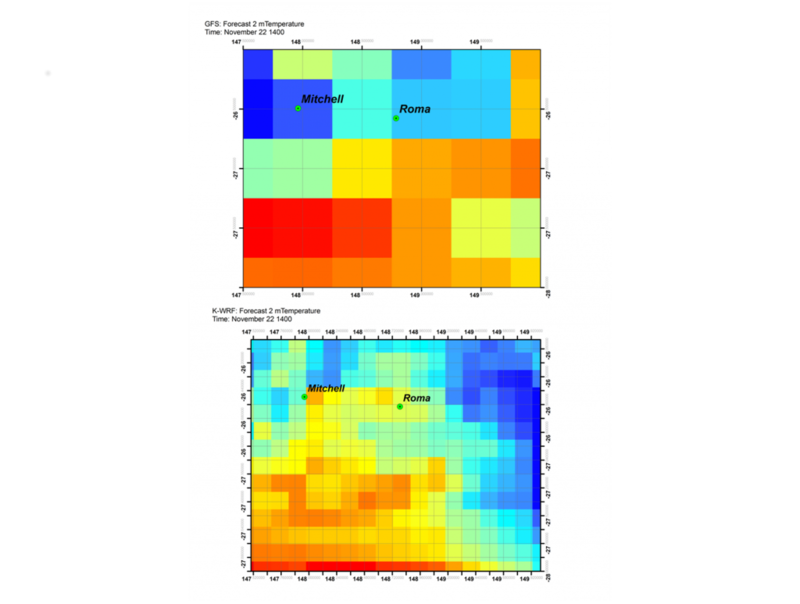 Analysis has shown our weather model to be highly accurate in forecasting the evolution of weather patterns that directly influence the development of high heat stress events. Continuous performance reviews of this forecasting system are made by Katestone’s scientists to ensure ongoing improvements to its performance and delivery of data into the future. What is the WRF Model? The WRF Model is a next-generation meso-scale numerical weather prediction system designed to serve both atmospheric research and operational forecasting needs. It features two dynamical cores, a data assimilation system, and a software architecture allowing for parallel computation and system extensibility. The model serves a wide range of meteorological applications across scales ranging from meters to thousands of kilometres. In addition, WRF provides extensive Physics options on parameterisation. The WRF model is used in a growing number of applications, which includes national meteorological services, militaries, governments and universities worldwide. The WRF Model is daily, initialised by the GFS data, in order to generate a seven-day three-dimensional meteorological dataset. The WRF model downscales the GFS data to a much higher resolution, temporally and spatially. This method is optimised to produce a more accurate representation of local meteorology, taking into account influences that occur on a smaller scale such as land use and terrain. The Katestone NWS setup is a result of extensive research and is configured specifically to simulate and forecast Australian weather, following best practice. The configuration of the WRF model was based on detailed studies, ensuring that the settings selected are appropriate in forecasting weather over Australia.